Bruce Galloway leads by example. Invested as Acadia’s seventh Chancellor in 2018, he is Past Chair of Ovarian Cancer Canada and of the Oakville Hospital Foundation. 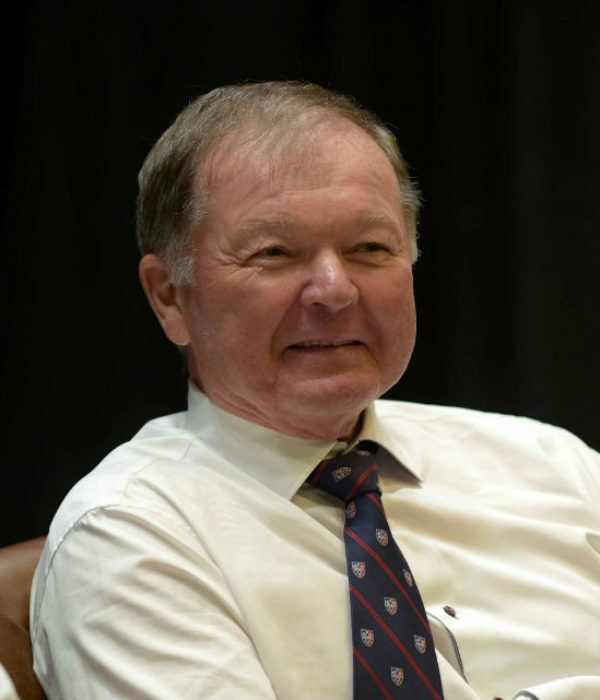 A member of Acadia’s Board of Governors from 1991 to 2009, Galloway was awarded an Honorary Doctor of Civil Laws in 2003 for his many contributions to Acadia, and in 2015 was recognized with the Distinguished Alumni Award. He retired as Vice Chairman of the Royal Bank of Canada in 1999. At Acadia’s 2018 Spring Convocation, Bruce Galloway (’68) was invested as the University’s seventh Chancellor, succeeding Libby Burnham (’60) when her seven-year term ended. His journey to that moment began more than 50 years earlier, when he arrived at Acadia from his Montreal home in 1964 to study and play football. An exceptional athlete, he played both offensive and defensive end for his first two years before switching exclusively to defensive end for his final two seasons. When Acadia celebrated 50 years of varsity football in 2006, Galloway was named a member of the 1960s All-Decade team. Originally a science student, he switched faculties and in 1968 graduated with a Bachelor of Commerce degree. He then joined the Royal Bank of Canada, where he held progressively senior positions. In 1994, he was appointed Vice Chairman and served in that role until he retired in 1999. Since retirement, Galloway has remained active in the business world as a board member of several companies, and he is Past Chair of Ovarian Cancer Canada and of the Oakville Hospital Foundation. He is also one of Acadia’s most important volunteer leaders and benefactors. Galloway served on Acadia’s Board of Governors from 1991 to 2009 and served three years as Acadia’s Manning School of Business Executive-in-Residence between 1999 and 2002. In 2013, he stepped forward to lead the Twenty Wing campaign to renovate Patterson Hall as the new home of the Manning School of Business and was the campaign’s first donor. In addition to the Patterson Hall project, Galloway has been a generous donor to the new Stevens Centre, and the Sheila (Nickerson) Galloway Scholar-Bursary is awarded annually to an entering student from Nova Scotia on the basis of financial need and academic performance. For his extraordinary contributions to Acadia, he was awarded an Honorary Doctor of Civil Laws in 2003 and recognized with the Distinguished Alumni Award in 2015.